This project came to us through a recommendation from a builder we have worked with for a number of years. 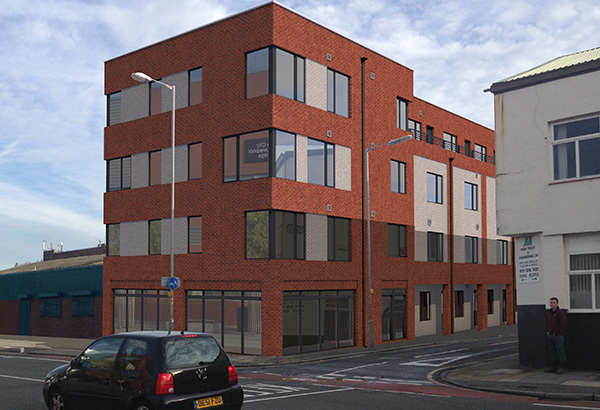 One of his associates who had been working in the area for a number of years, was struggling to secure planning permission for a site they hoped to develop in north Liverpool. We were asked to look at the project with a view to gaining planning permission. Following consultation with both the previous designer and the case officer, we were appointed to the project and secured planning permission for the project around 4 weeks later. The Project is now on site and due for completion in 2015. Sketch View of our final proposals. View of proposed building from the main road on the principle elevation. View of proposed building from the side street.